We're at the midpoint of 2017 and it's time again for the Certify SpendSmart™ Report on business travel and expense spending trends. For the past 18 quarters, this complimentary resource has provided valuable benchmark data and trend analysis to help CFOs, controllers, accountants and business travelers make more informed expense choices and purchases on the road. And analyzing the more than 10 million quarterly expenses and receipts processed by our system in Q2 2017, the new Certify SpendSmart Report continues to track broader changes and trends in the marketplace with even more expense spending and business travel insights. One of the biggest trends we've covered has been the steady rise of ride-hailing services like Uber and Lyft. After slowing to a near standstill in the first quarter, this latest report shows ride-hailing leader Uber picked up 2% to claim a commanding 55% of ground transportation overall in Q2. Lyft matched Uber's growth, adding 2% to end the quarter with 8% of category receipts and expenses. Ride-hailing's gains came largely at the expense of taxi, which dropped to 8% of the category total; the first time SpendSmart data puts taxi at a single-digit share of rides. In addition, car rental experienced a two-point decline in business travel transactions, netting 29% of receipts and expenses in the second quarter. Taxi is by far the biggest loser in year-over-year trends, dropping six percentage points since the second quarter of 2016. In analysis of major U.S. metros, taxi also lost ground in all but Miami and Atlanta, while Lyft picked up share everywhere but Miami where receipts and transactions were flat on the quarter. Conversely, Uber lost between 1-6% in every city but Chicago where the ride-hailing leader gained 1%. Despite this hit-or-miss performance, Uber remained the number-one most expensed brand processed by the Certify system for the second quarter in a row, increasing nearly two percentage points to 9% of all expenses and receipts. Uber also took top honors for user ratings in ground transportation, earning 4.46 stars to second-place finisher Lyft's 4.22 stars. 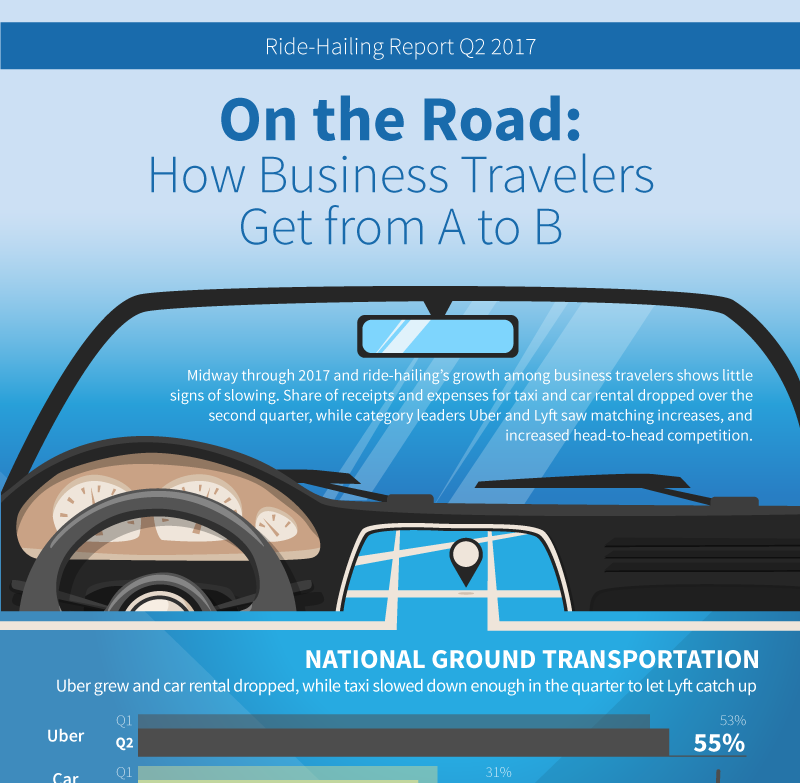 Click the image below to see all the data in our full ride-hailing infographic. Looking across the spectrum of business travel services, Starbucks continues its reign as the most expensed restaurant, nearly four full percentage points ahead of McDonalds in second place. Delta remains the top seat in air travel, while Hampton Inn hangs on as the most expensed hotel brand. Transactions for alternative hotelier Airbnb grew 31% in the second quarter, although it remains a small share of the total lodging category with just .42% overall. How do your favorite brands stack up? See who the most expensed and highest rated ravel vendors are by expense category, including Starbucks, McDonald's, Subway, Delta, United, Marriott, Hampton Inn, National Car Rental and more. Check out the latest Certify SpendSmart Report today.